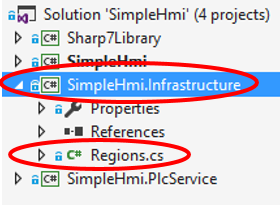 This article is part of a series that explains how to write an HMI with C# and WPF. Navigation in WPF is one of the most complicated topics, because it can be implemented in many different ways, but it can make your application very complex to handle when it starts growing. In this article we will see how PRISM framework implements the navigation, and how to use it in our HMI. We will use as a starting point the HMI that we built in the first article of this series. This is the new UI that we are going to build. To create and swap different pages in WPF, the approach is usually to create UserControls (called Views) that are contained in a ContentControl. The ContentControls (regions) are hosted in a Window, and their functionality is just to host and change the UserControls. So to create our application, first we need to create all our Views and ViewModels in the project. Now that we have multiple Views and ViewModels, we need to use the PlcService inside all the ViewModels, so we can not keep it local in MainViewModel anymore. A standard way to handle global services is to use Dependency Injection, and in particular Constructor Injection. We can inject the PlcService in the constructors of our ViewModels. The service will be provided by a DI container (Autofac in this example), which will handle all the dependencies. 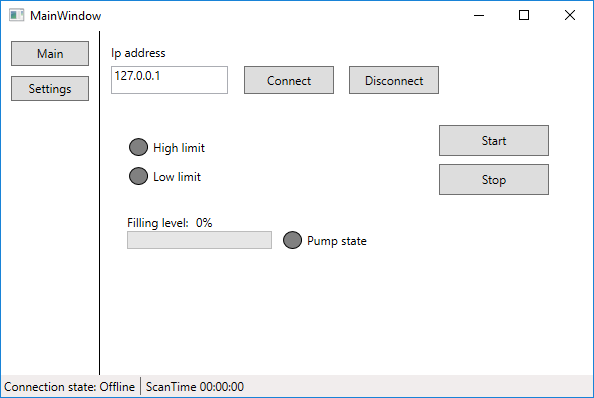 Now that every ViewModel has access to the Plc, we can subscribe to the the ValueRefreshed event to synchronize the ViewModel data with the plc data. As you noticed we are not using S7PlcService, but we are using an interface. It is common to abstract the services and to use the interfaces because it’s easier to have multiple implementation of the services. For example we have a PlcService that uses a S7 plc, and we will have an implementation that will just display values for Design data. When we use Dependency Injection, we have to configure the DI container that will be responsible for creating our objects. PRISM supports natively the most famous containers, like Unity, MEF, Autofac, StructureMap, Ninject, etc. In this article I will use Autofac. 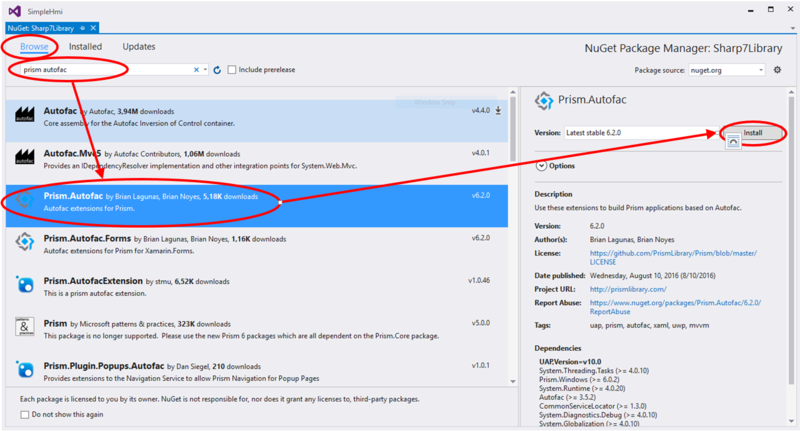 To install Autofac for PRISM we need to go to “Manage NuGet packages”, select the “Browse” tab, write “Autofac PRISM” in the search bar and install the “Prism.Autofac” package. After installing Autofac we have to configure our project to use it. First we have to create a Bootstrapper class and to override the methods that create the Shell. 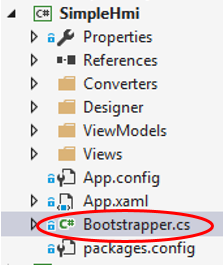 And from App.xaml.cs we have to override OnStartup to use our Bootstrapper. We mentioned before that “something” has to provide to the ViewModels the services that they need. When you use Dependency Injection, it’s the container that has this responsibility. If we want the container to create the services, we have to register the services into the container. To do this, we have to override in the Bootstrapper the ConfigureContainerBuilder method. Also in the case of PlcService (and the most of services) we have to mark the Registration as Single Instance. This because Autofac by default creates a new instance of the registered class every time it’s asked. Instead of that we want a single global instance for the whole application (a Singleton), so we have to write “.SingleInstance”. In the YouTube video I show what happens if we don’t mark it as SingleInstance and how to debug these situations. This is the code to register the PlcService, notice that we are registering both the service and the interface. Once we registered our services in the container, we also have to register our Views. As you see, the code to register regions is different from the code to register the services. In particular, the biggest difference is that it requires a string. The string is used as a URI for the navigation. In particular it is used as a parameter for the NavigateTo method. Registering the view is not enough to resolve the Views and the ViewModels. We also need to use the ViewModelLocator of Prism. ViewModel locator is a known approach in WPF to inject ViewModel into the DataContext of the View. Also the ViewModelLocator makes use of DI container to resolve the ViewModel, so we can use constructor injection in the ViewModel and get all the dependencies resolved automatically. It’s really important that you understand how ViewModelLocator works. Now that all the services and the views have been registered from the container and the ViewModels are resolved from the ViewModelLocator, we can create the regions that will contain our Views. 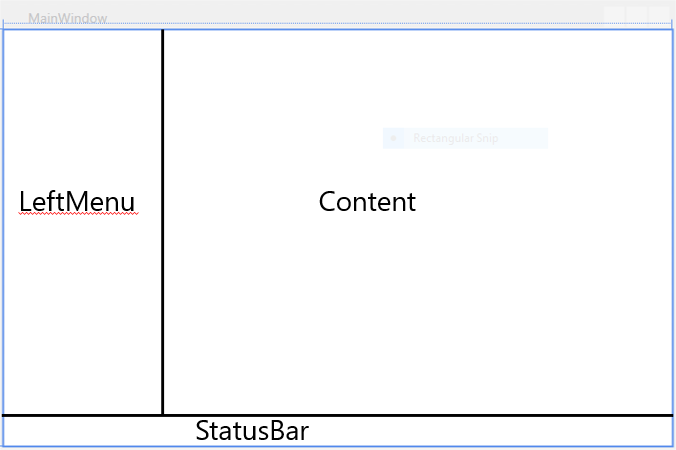 In the MainWindow we create 3 ContentControls and we place them in a Grid. Also we have to assign a RegionName to every ContentControl. As you can see from the code we are using a constant for the RegionName, instead of a string. The constants for the regions are usually put into a separate project called Infrastructure, for a better mainteinability of the project. To assign the Views to the Regions we need to use the PRISM RegionManager. We can assign the regions in the MainWindowViewModel, which is called as soon as the MainWindow is created. To navigate between regions we also need to use the RegionManager. In the LeftMenu we assign the commands to the two buttons that are responsible for the change page. Then in the LeftMenuViewModel we provide the implementation of the commands by using RegionManager and PRISM DelegateCommands. To change View inside a region we have to use the method RequestNavigate. This takes into input the region that we are targeting and the url of the View. The url is the name of the View that we assigned to it when we registered the View in the Bootstrapper (usually the name is the same of the class name). Let’s see now how settings page is implemented. The settings are usually stored in the plc, in some retentive area. So we need to load the settings when we load the page and be able to change them if needed. To load the settings from the plc when the ViewModel is loaded, we need to use the INavigationAware interface. OnNavigatedTo is called when the page is loaded, so here we refresh the values from the plc. IsNavigationTarget is called before the page is loaded and must return true, unless you want to forbid the access to the page. OnNavigatedFrom is called when we are leaving the page. Once we loaded the data from the plc, it’s trivial to modify them by using the plc service. One of the best features of WPF is the possibility to use design data while editing the User Interface. The problem that we face when using dependency injection is that DesignTime is not supported anymore because the ViewModels’ constructor needs to be without any parameter, but we are resolving the services from the container exactly in the constructor. Also to use the DesignData we should assign the DataContext in the xaml data, but in our case we have the ViewModel locator that assigns it automatically. 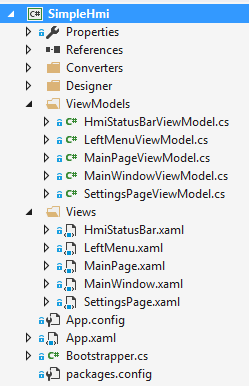 To use designer support, we can create a DesignerViewModel with a parameterless constructor and assign it to the View. As you see it’s not complicated, but it also needs a DesignPlcService. You can see the code here. As you see we are using a DataContext prefixed with the “d” letter. That “d” means that we are ignoring that DataContext at runtime, but we are initializing it when the WPF designer is in use. Given how easy it is to swap the service implementation with this architecture, we can create a plc service that replicates the behavior of the S7 plc program, but in C#. This will give us the possibility to test the application without the need of the real plc. The code for the DummyPlcService is here. Changing the type of PlcService in use is really simple, we have just to open the Bootstrapper class and comment/uncomment the service that we want to use. As usual, you can download the code and the plc program on GitHub. Would you recommend Prism & Autofac over MVVMLight and Castle Windsor? As per your previous article “WPF navigation with dependency injection (DI/IOC)”. I’m interested to hear your thoughts on why you chose one vs the other, i.e. Prism vs. MVVM Light, Autofac vs. Castle Windsor. Thanks for another great article, these examples are really helpful for me. I used MVVM Light a lot in the past, as I believed that PRISM was over-engineered and too complicated to get started with. In the recent projects I had to use the latest version of PRISM, and I saw that it has the exact same functionalities of MVVM Light, (Databinding, Commands, Messenger and ViewModelLocator), but it also offers Navigation and Modularity. Also it has been simplified and tweaked a lot from the previous versions, and now you can really pick only what you need. 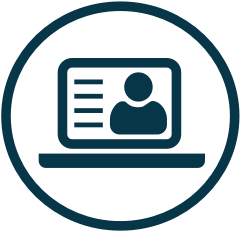 Navigation in particular saves you from writing a lot of boilerplate code to get it right, and it is extensively documented on YouTube videos and Pluralsight videos. So if I had to start a new project today, I would use PRISM because it takes me less time to get everything up and running. About the container, I used AutoFac because PRISM doesn’t support Windsor out of the box. Still, the containers offers the same basic functionalities and it’s just a matter of preference what you want to use. I believe that if you have a project that has a navigation based on that article, it is trivial to convert it to PRISM. Thanks very much for your detailed response, it perfectly answers my question. Why not used ModuleCatalog ? I saw many tutorial using this and I’m confused a little bit. You registered the view in the RegionManager. Modules were not the scope of the article, but I always use Modules in my application. I the latest applications I use Autofac, and it comes with its own modularity, so I don’t use ModuleCatalog.